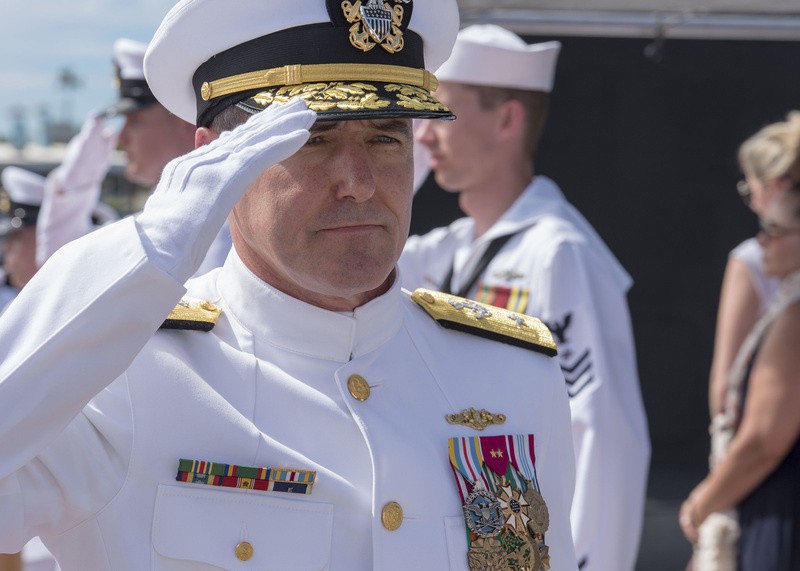 The new leader of the Navy’s Pacific submarine force pledged to keep the command “forward-leaning for combat operations” in an age of fast-moving technological change. “The pace of that technological innovation continues to grow,” Rear Adm. Blake Converse, the new commander of Submarine Force, U.S. Pacific Fleet, said at his Thursday change-of-command ceremony aboard USS Mississippi (SSN-782) docked at Joint Base Pearl Harbor-Hickam, Hawaii. To meet that challenge, he said he intends to place new emphasis on expeditionary logistics and expeditionary maintenance as being essential for the future success of the submarine force in the Pacific. That includes “effectively training our crews” in how to meet that need for expeditionary expertise and continuing to adapt to advances in technology. “We have work to do” because no one knows exactly “what that fight is going to look like in next 10 years,” Converse said. Converse’s command encompasses 60 percent of the nation’s submarine force and has elements operating from the Eastern Pacific to the Indian Ocean. Thirteen thousand sailors and civilians are assigned to the command. As the featured speaker at the ceremony, Adm. John Aquilino, U.S. Pacific Fleet commander, noted the position of the submarine force leader is the “the hardest job in the Navy,” not only because of the distances he is responsible for but because of the number of bosses he has. Those include U.S. Strategic Command, the Navy’s submarine force commander, the chief of naval operations, “and lastly, he works for me,” Aquilino said. Aquilino added that Caudle “instilled a warfighting culture” in the Pacific submarine force. That included improved tactical exercises, testing new systems, expanding commanders’ knowledge of what they can do with those systems and working with allies and partners. Caudle also mentioned the first of what is expected to be an annual conference of submarine commanders from across the Indian and Pacific oceans as an event to build on for the future. He reminded those at the ceremony that they were unique even in the military. The submarine force constitutes 1 percent of the 1 percent who volunteer to serve in today’s armed forces. “You are the last of the independent maritime warriors [whose] primary objective is bringing the fight to the enemy,” he said. For his service, Caudle was awarded the Legion of Merit. His wife, Donna, was presented an award for Superior Public Service for her work with sailors’ and civilian employees’ families.